Determining the right Exit Strategy is a combination of listening to your needs and goals, analyzing your specific business, and understanding your industry and its trends. There are multiple options for an Exit Strategy. You may already know the direction you want to take, or may want a top-down review of the various paths that are available. Whatever your starting point, we explain your options, as well as the impact of those options, both in terms of the value you can realize and the potential tax consequences. 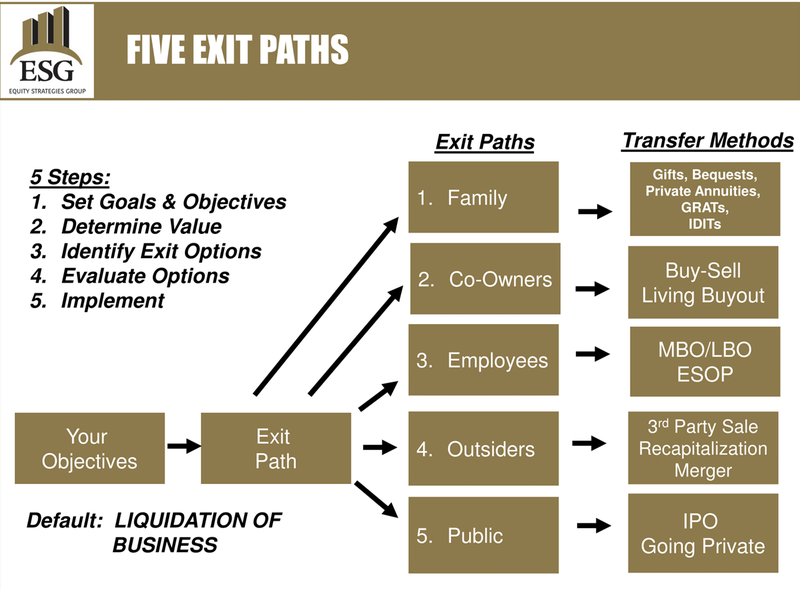 Working through our Exit Planning process, Equity Strategies Group will help you determine which of the five Exit Strategies best meets your objectives. We will educate you on the impact of each scenario in terms of potential consequences and the implementation steps you need to take, and we will assemble a team of experienced professionals to help you navigate the strategy you select.